← ASK FATHER: Can demons enter a church during the Traditional Latin Mass? Here’s Msgr. Pope’s list, with a brief tease. Read the rest there. Consider this eightfold list of modern errors that are common even in the Church. There are many errors in our time that masquerade as wisdom and balance, but they are no such thing. I have written before (HERE and HERE) on many errors of our time of a more philosophical nature. The following list that I compile is more phenomenological than philosophical. To say that something is phenomenological is indicate that it is more descriptive of the thing as experienced, than of the exact philosophical or scientific manner of categorizing it. For example, [See? He has to do it too!] to say the sun rises and sets is to describe the phenomenon, or what we see and experience. The sun does not actually rise and set. Rather, the earth turns in relation to the sun which remains fixed. But we use the phenomenon (what we experience) to communicate the reality, rather than the more scientific words like apogee, perigee, nadir and periapsis. And thus in the list that follows I propose certain fundamental errors of our time that are common, but I use language that speaks less to philosophies and logical fallacies, and more the to the errors as experienced. Further, though the errors are common in the world, I present them here as especially problematic because we all too often find them in the Church as well. They are sadly and commonly expressed by Catholics and represent a kind of infection that has set in which reflects worldly and secular thinking, not Godly and spiritual thinking. These are only eight. I am just getting started. I hope you will add to the list and define carefully what you identify. 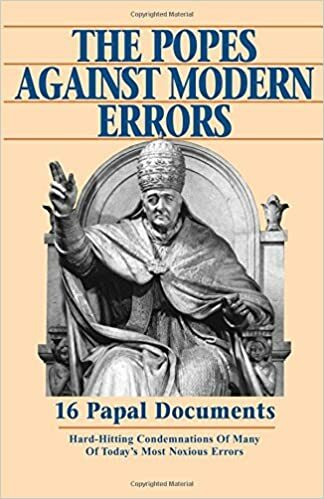 But for now, consider this eightfold list of modern errors that are common even in the Church. This entry was posted in "How To..." - Practical Notes, Liberals, Our Catholic Identity, The Drill and tagged error, modernism, Msgr. Charles Pope. Bookmark the permalink. A good selection of eight for liberals of good will. The Latin word “error” suggested by Greek “hamartano” has the idea of missing the point, going astray, swerving off the straight road. There is a potentially good version of anthropocentrism missed at swerve #7. Granted that God is above all, the rest of the universe is centered on man, made for man. And the man Jesus is the fullness of divinity bodily. Errors can typically be backed up to Truth. 3. Universalism is the belief that most, if not all people are going to be saved in the end.. No: it is the belief that all people are going to be saved at the end, because God cannot possibly have it end otherwise. A belief that most will be, such as Pope Benedict taught in Spe salvi 46, is quite Catholic. (“many” means “much too many”). 4. It is quite right that love can and should, occasionally, use rebuke and praise. However, kindness does have more of the General characteristics of love to itself, so to say that kindness is only as much an expression of love as rebuke is would be wrong. The others, especially 1, 4 and 6: spot on. I read this article early this morning. Spot on! Were he admitted to a future conclave, there would be many supporters of Pope for Pope! On the love/rebuke/kindness thing: it is contextual. If love demands I rebuke someone for a wrong, and I fail to do so, and they continue in a grave sin, then the results could be maximally opposed to love. Thus kindness can be weakness when it departs from the truth, and not anything like love.